Conceal your pocket holes with a face-grain wooden plug cut from the same material-even the same boards-as your project. The result is a plug that blends seamlessly into the surface, allowing you to use pocket hole joinery in areas that would otherwise be clearly visible. To use, simply slip the Kreg Custom Pocket Hole Plug Cutter into a Kreg Jig® K3, K4 or K5 in place of the normal guide block. 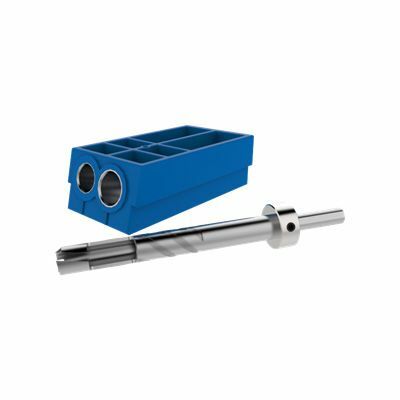 Install the supplied hollow-core Plug Cutting Bit in your drill and bore the holes as you would when drilling pocket holes. Once the plugs are drilled, cut them free with a band saw or hand saw. The Custom Pocket-Hole Plug Cutter also accepts optional bits that cut plugs to fit Kreg Micro-Pocket pocket holes (see Rockler Item #50477), or plugs to fit the larger HD plug size (see Rockler Item#58186).